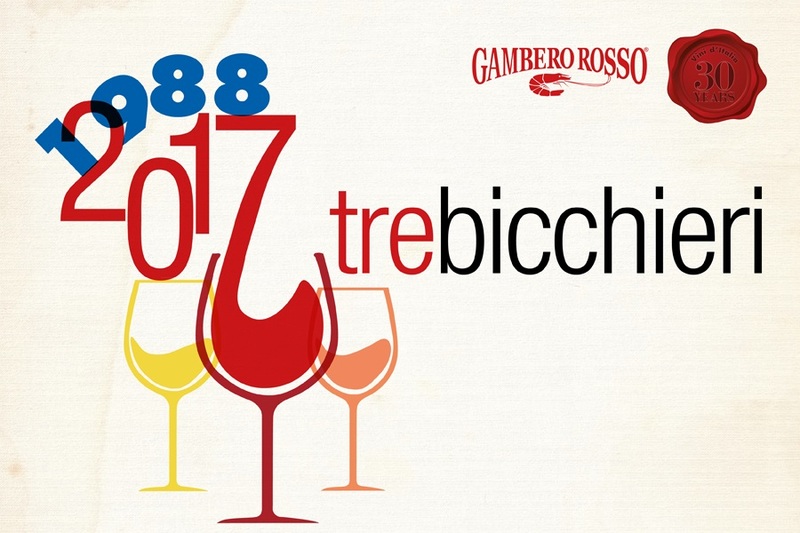 This is the promised continuation of my post about three great Campanian wines. I apologize for writing so lengthily about them. It’s the curse and blessing of the enthusiast: Confront me with wines of this caliber, and I do go on. So on I will go. 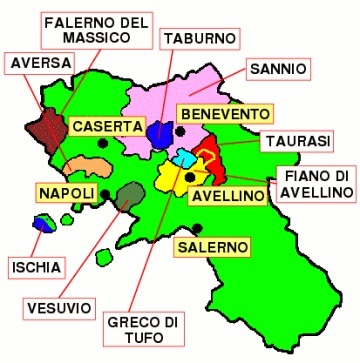 This time it’s on to the two remaining points of what I’ve dubbed the Golden Triangle: Tufo and Taurasi. 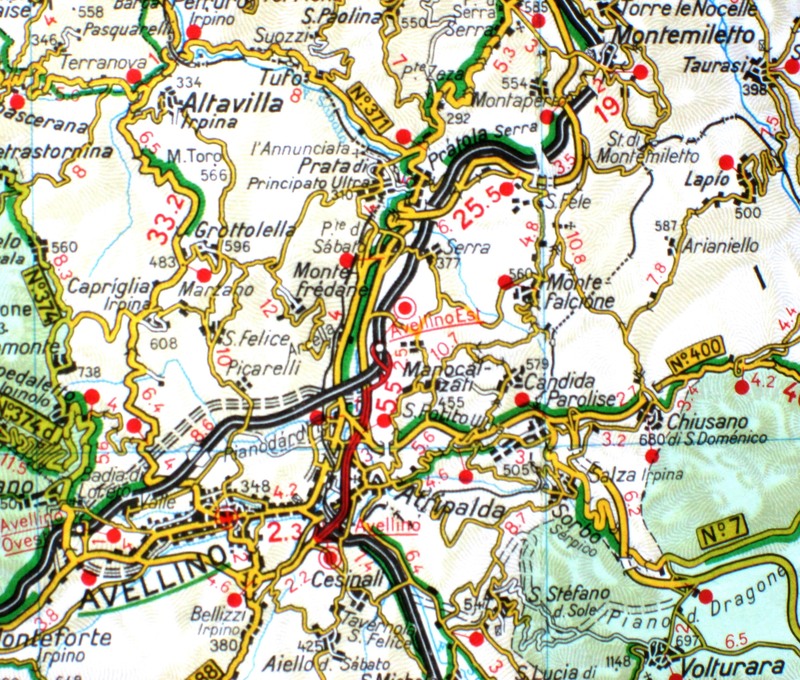 The town of Tufo lies about 20 kilometers north of Avellino, more or less on the road to Benevento. There, this spring, I visited the Benito Ferrara estate. This is very hilly country, and the soils are intensely volcanic, rich with all sorts of mineral traces. In fact, the old Di Marzo sulfur mine – for decades the area’s major employer – faces the main road of the town. 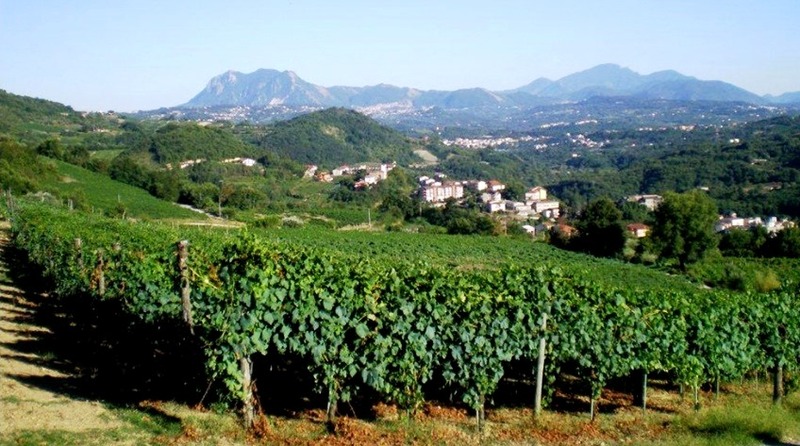 Benito Ferrara’s eight hectares of vines are situated high among those hills, between 450 and 600 meters. 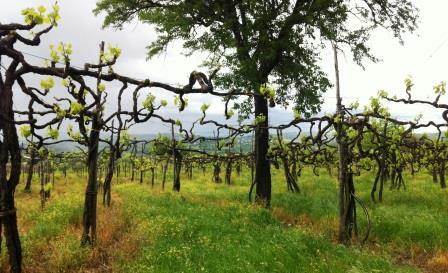 All the steep vineyards face south – ideal location and ideal exposition for producing great Greco di Tufo. 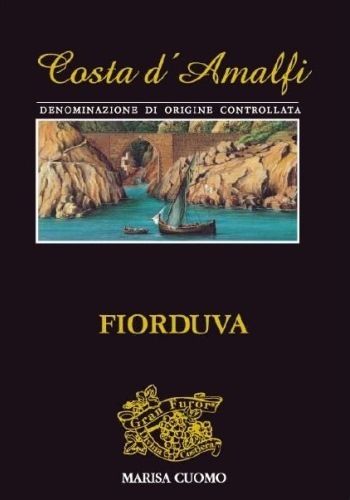 In fact, the winery makes all three of Irpinia’s DOCG wines, and at a very high level, but its Greco di Tufo, and especially the cru Vigna Cicogna, is its flagship wine. Vigna Cicogna pretty regularly wins Tre Bicchieri and Cinque Grappoli, which tells you all you need to know about its standing in Italy. 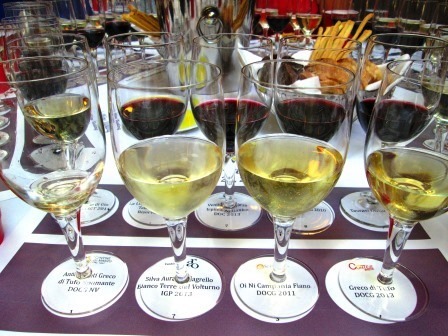 Here I was offered a horizontal tasting of the estate’s range, which is quite extensive despite its relatively small size. Intensely mineral, slightly sulfurous nose. On the palate, great white fruit, recalling, without quite being, pears, with tons of mineral behind. Mineral/dried white flowers finish. Excellent: classic Greco di Tufo. If you don’t know Greco, this is the wine to teach you. Like the preceding wine, only more so. Nose and palate even more intense, already showing complexity – hazelnuts, herbs, thyme, and sage are among the many elements to be found. The wine has a slightly olive-y, faintly oily feel in the mouth that I consistently find in the best Greco di Tufo. This is simply a lovely wine, as true to type as it can possibly be. Lovely aroma of hazelnuts, white flowers, and mineral, with the same components showing up on the palate. Very different from the Greco: not as mineral, lighter in body and a bit more elegant/restrained, but still a lovely example of its kind. All three of these whites opened and changed in the glass as they sat and I tasted and re-tasted them. That for me is also one of the hallmarks of a great wine: It is alive and mutable, not inert. All three are vinified entirely in stainless steel, with no wood contact at all, so what one tastes in them is unmediated grapes and soil – the variety and the terroir, which, as far as I am concerned, is exactly as wine ought to be. 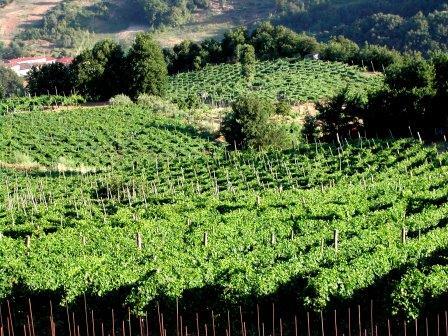 Benito Ferrara’s red wines – an Irpinia Aglianico Vigna Quattro Confini and a Taurasi of the same name – are also quite good, but for my Taurasi focus here I’ve chosen the remarkable Guastaferro estate, so I’ll head along there. 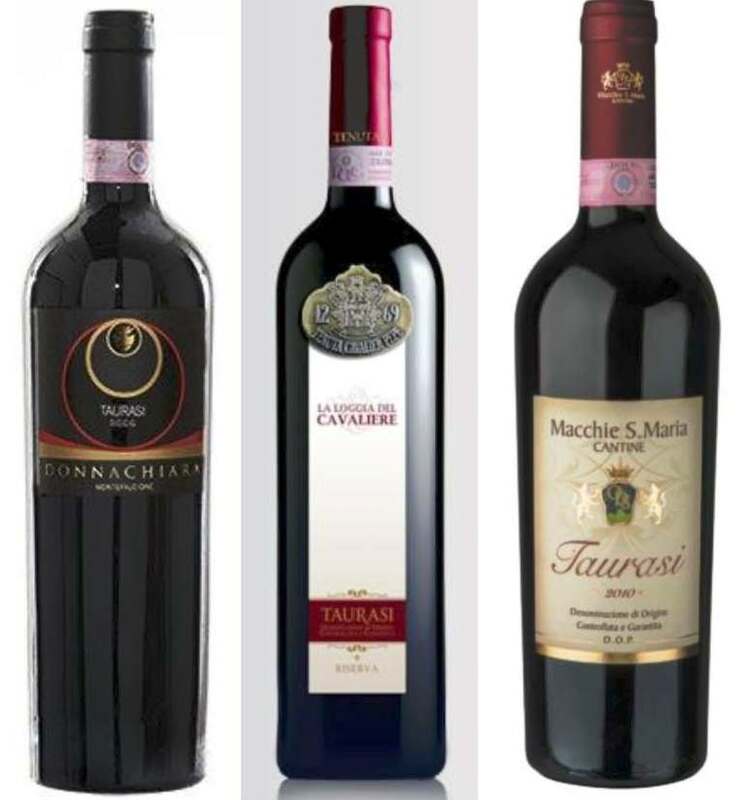 Located right in the commune of Taurasi are about seven and a half hectares of prime Aglianico vineyards that young Raffaele Guastaferro has had the good fortune to take over from his father. Two and a half of these consist of pre-phylloxera vines of between 175 and 200 years of age. Yes, you read that correctly: 175 to 200 years old, on their own roots. The remaining vineyards have been planted with cuttings from those old vines – so Guastaferro has all pre-phylloxera stock even though not all pre-phylloxera era. That, quite obviously, is a patrimony of enormous potential and very great responsibility. Raffaele has risen to the challenge handsomely. 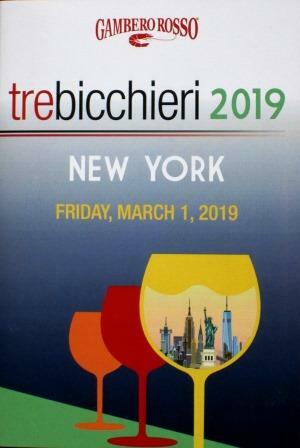 I was lucky enough to taste with him a selection of his Taurasi and Taurasi Riserva – the latter vinified exclusively from those two and a half hectares of ancient vines – starting with 2004, when he took over winemaking from his father. This wine spent one year in barriques and six months in botti (huge barrels holding 10,000 liters or more) before being bottled. 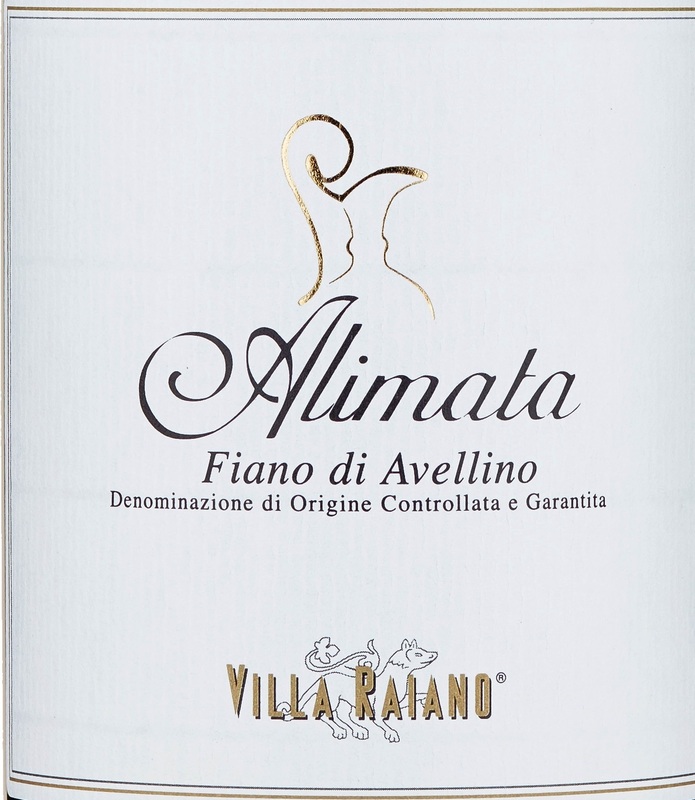 It is a lovely wine, of pure Aglianico character – dark, cherry-like fruit, firm tannins, supple acidity, with great depth, and maturing beautifully – but you can still taste the barriques in it. “My father is in love with barriques,” he says, “but I have gotten rid of them. I now use only botti. That’s what my generation does.” I will pray on my knees, fasting, for a month, that he may be right. Vinified entirely from the oldest vines, which naturally restrict yield, and aged in botti for one or two years, this wine had an amazing nose, huge and intensely fruity and mineral. On the palate, the tannins are only beginning to soften, but the enormous fruit and bright acidity are quite evident. Clearly, a wine still young, but structured to last very long indeed. For my taste, this was a truly great Taurasi, which is to say that it can stand with finest red wines from anywhere. But then I tasted . . .
Small producers like the three I’ve just written about – there are many more I could have chosen – illustrate the exciting progress of Campanian winemaking. Small growers throughout the zone have started making their own wine and have begun a swift and steep learning process as they master the ability to express the nature of their vines and soil. They have wonderful specimens of both to work with, so for wine lovers, the prospect ahead is for years of excitement and discovery. Oh frabjous day! Calloo! Callay!